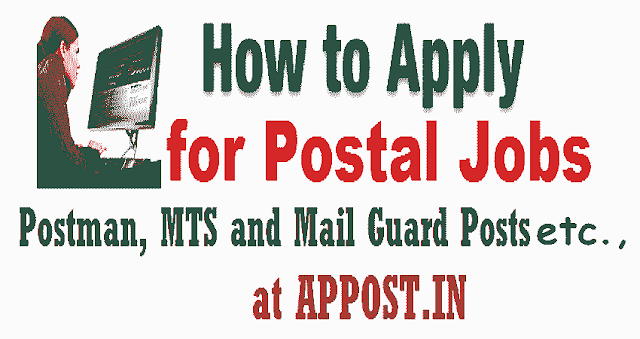 How to Apply for AP Postal Jobs /AP Postal Circle Posts at APPOST.IN/ How to apply for the AP Postal Circle #Postman, #MailGuard Posts Recruitment, how to fill the Online application form, How to Apply for Postman, Mail Guard Posts at APPOST.IN, last date for apply, exam date, hall tickets, results @ appost.in. Office of the Chief Postmaster General, Department of Posts issued the Postman and Mail Guard Posts Recruitment notification and invites the applications from the desirous & eligible Applicants to fill up the posts of Postman and Mail Guard in the following Postal Divisions / Units in Andhra Pradesh Postal Circle. This notification details have already published in this website. So, Candidates are requested that read the notification and follow the below instructions for applying online. The Applicant has to access the website www.appost.in for seeing the detailed Notification /Advertisement issued by the Chief Postmaster General, A.P.Postal Circle, Hyderabad and the Instruction Sheet/Information Brochure. Before starting Registration of his/her application on the website, the Applicant should read the notification, instruction sheet and FAQs carefully. He/she has to evaluate his/her eligibility for the category. His / her eligibility will be evaluated during the registration process and the process shall terminate for ineligible applicants and reasons there for would be prompted. Before starting his/her registration of his/her application on-line, the applicant should be ready with the soft copies of passport size photo (not more than 20 KB in JPG/JPEG format) and signature (not more than 10 KB in .jpg/jpeg format) which are required to be uploaded after filling up of the inputs and uploading the application on- line. One applicant has to submit only one application. If more than one application is registered, it will lead to rejection of all the applications registered by the applicant. The Prescribed Fee (application fee and Examination fee ) has to be paid as per the table through "Sunayasam" option in any Head Post Office in Andhra Pradesh / Telangana States listed in the Annexure. For applying, the candidate has to browse the website www.appost.in and should read the instructions and notification thoroughly. The Code Numbers for selecting the Division are given in the Para 2 (a) of the notification. Since preview option is provided before saving the application no correspondence will be entertained for modifying the application. Provision has been made to the candidates to know the status of application submitted through a grievance provision which is available in the website www.appost.in. No documents to be attached as proof at the time of submitting the application. The Applicants after successful registration of the On-Line Application are advised to keep print out of his/her "PREVIEW" of his Application, copy of fee chalan/ receipt issued by the Post office for any future reference. The Applicant has to furnish a Declaration to the effect that the inputs furnished by him/her are true, complete and correct to best of his/her knowledge and they will be supported by the original documents/testimonials as and when required/demanded. Any false/incorrect information found/detected at any stage,his/her candidature/appointment will he summarily rejected/terminated. Requirement to serve in the Army Postal Service Any person appointed to the posts as per the notification shall be liable to serve in the Army Postal Service in India or abroad, if required. or b) Who having a spouse living, has entered into or contracted a marriage with any person will not be eligible for appointment. Provided that the Central Government may, if satisfied that such marriage is permissible under the personal law applicable to such person and the other party to the marriage and there are other grounds for so doing , exempt any person from the operation of this rule. Only single application will be entertained. If more than one application is registered, it will lead to rejection of all the applications registered by the applicant. Fee should be paid in one installment through Sunayasam option in any Head Post office in Andhra Pradesh/ Telangana States listed in the annexure. Payment made in any other mode will not be accepted / refunded. For Receiving the SMS to the registered mobile number the candidate has to Note that the mobile given at the time of payment of fees is not registered under "DND"
The candidate has to look at preview for verification and correctness of data fed before submitting his / her application by clicking "SAVE" button once the application is successfully submitted no correspondence will be entertained for modifying the application.